Linda’s Tavern: The Secret Bathroom | Shits and Giggles: A Seattle bathroom tour! Linda’s Tavern is classic Seattle. Great staff, cheap drinks and fun clientele always. The food is a greasy spoon, and there are few places better to sit on the outside patio in Seattle taking in the hipster elite, and realizing this bar was the last place Kurt Cobain stopped at before his tragic ending. On another note, the bathrooms: Linda’s most used bathroom are pretty scary. The Men’s room has a half broken swinging door that gives all passerby’s a perfect view of what is going on inside. Ever wanted to get a sneak peak of your friend’s junk? Just wait til they go to the can and be a creepy peeping tom in the bathroom. The men’s room is very dirty and left to the use of drunk hipsters who don’t mind it. The urinals are dirty and loaded with the latest grind core stickers. I just wonder who is ballsy enough to put those stickers on the urinals. 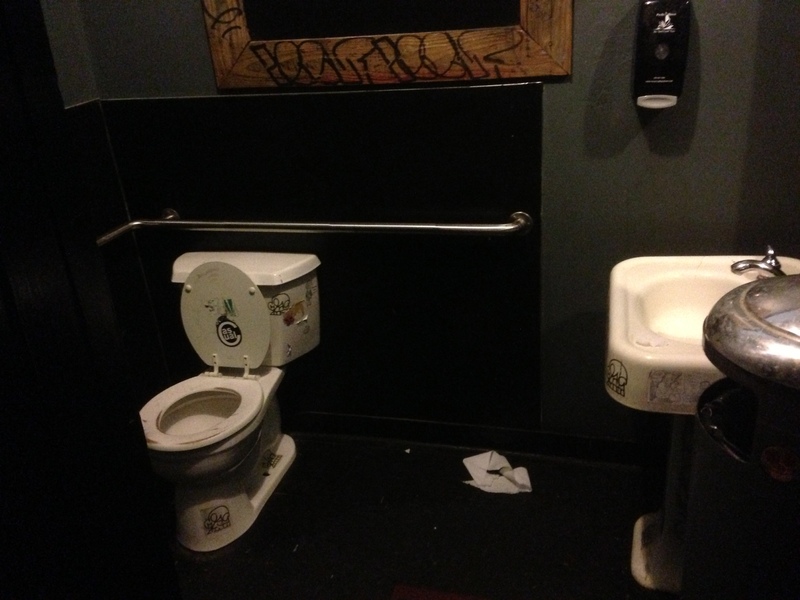 The stall and toilet would be passable for someone to sit on, if the previous users hadn’t used the seat for extra target practice of their pee. It is always caked in pee when I go in there. Which leads us to the Secret bathroom at Linda’s. This one is located near the kitchen in a bit of a hidden space. This bathroom is always useful if one needs a clean respite from the horrors of scary bathrooms, or if you need to hit that #2 (Who do you work for #2?). Some great old fashioned gas station looking sinks and garbage cans give it a tiny bit of flair, but mainly this bathroom scores points, as it is so much better than the most used restrooms them have. 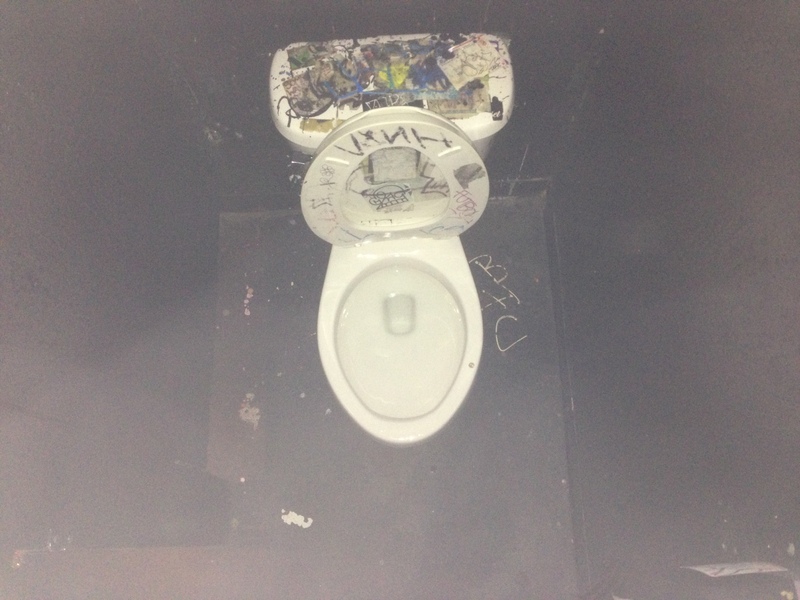 This entry was posted in reviews and tagged bathroom, linda's tavern, Seattle, secret bathroom, shits and giggles. Bookmark the permalink. ← The Hurricane: Holy WTF?